I think by now it’s pretty clear that I’m a fan of both beer and books, but so far I haven’t spent much time looking at how these two things intersect. For today’s post I wanted to take a look at five establishments I’ve come across in my reading over the past few years where I wouldn’t mind grabbing a drink or two. I was initially tempted to call this a top five list, but quickly thought better of it. I’m sure there are a whole lot more I’m going to think of as soon as I hit publish! Just means I will have to make a Part 2 someday. This is a no doubt top choice of mine even though it may not be as recognizable as some of the other entries on this list. Soon after the Hobbits leave the Shire, Pippin laments the fact they will be unable to stop at this particular pub, which he claims boasts the best beer in Eastfarthing. That alone is enough to get my attention, but what really puts this place over the top is that you’d be drinking in the company of Hobbits. Let’s face it, Tolkien makes it clear these guys (with the exception of those nasty Sackville-Bagginses) like to party. Considering their days scheduled around six official meals, a love of festivals, and an abundance of “pipe weed,” Hobbits and good beer sound like an experience not to be missed. Thanks to the wonders of time travel and the power of compound interest, adventurous space travelers can dine in the absolute highest luxury imaginable at no immediate cost to themselves and watch the greatest show in the galaxy – its end – on a nightly basis. I don’t think any mention was ever made of a beer list, but I’d happily try out a few Pan Galactic Gargle Blasters and watch the show. Besides you never who you might spot here; renegade galactic presidents, thunder gods, or even your favorite long-lost paranoid android. As a muggle I’d probably need a really convincing fake ID to get in the door, but I think it would be well worth the effort. Sure I’ve been to the replica version at Universal Studios, but that’s not really quite the same now, is it? Imagine the fun one could have sipping on Butterbeer and Firewhiskey while soaking in the magical surroundings before hitting up Zonko’s Joke Shop. And if all else fails, you could always making make a drinking game out of watching Hogwarts students on awkward dates. What better way to pass the time on the sleepy Mars colony than by grabbing a seat at the planet’s first (and only) brewery? In addition to checking out the establishment’s surprisingly diverse tap list, you’d also have a front row seat to all the local intrigues and shenanigans currently occupying the colonists. Making a friend of Mary Griffith, the fiercely determined owner and brewmaster, wouldn’t be such a bad move either since one way or another she has a hand in most aspects of the colony’s daily happenings. This list needed a dive bar and by all accounts Cicero’s fits the bill perfectly. Having gradually expanded across four dilapidated buildings along the Hoolie River in Hyperion’s capital city of Keats, the bar was known for its smoky interior, low ceilings, and steady supply of background noise. The proprietor apparently had a thing for vintage Earth ales though to be honest that prospect sounded pretty hit or miss at best. It’s the sort of place you’d really just end up at to grab a beverage (or five) while preparing to do whatever it is that brought you out to the planet. Just hope the Shrike monster is contained while you do it. Happy Halloween! This year I’m running a double feature in celebration, showcasing a beer and a book that (hopefully) live up to the big day. Since it’s a bit early to start in on my beer, we’ll open things off with the book. When it came time to select a second spooky story for the month, my thoughts immediately turned to Dan Simmons, a name longtime readers and friends of the blog may recall seeing here on a few occasions. I had been meaning to read this for a while and figured I now had the perfect occasion to do so. 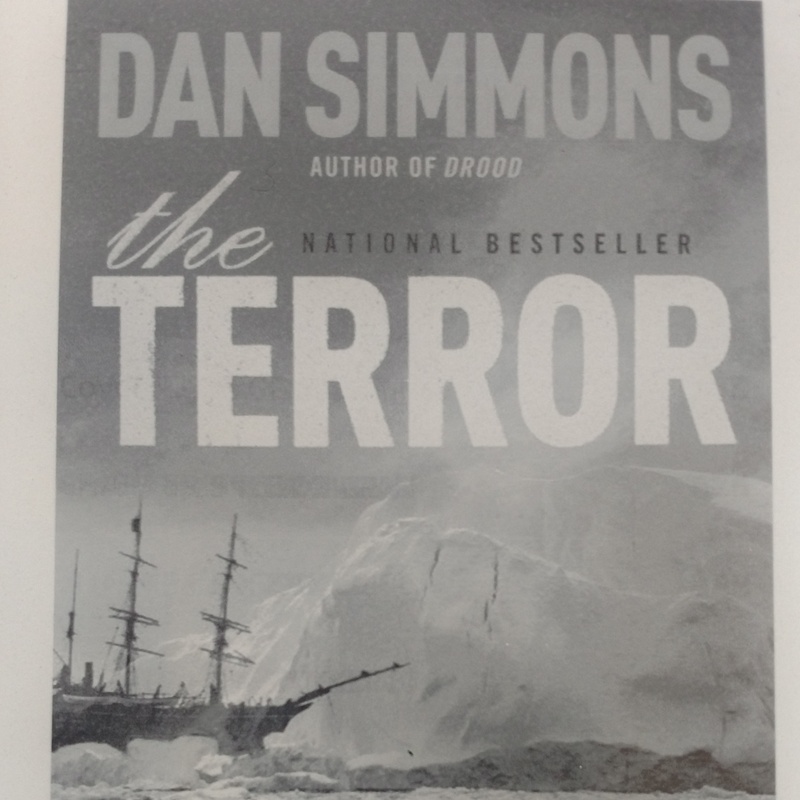 This story takes place in the years 1847-1848 and is a fictionalized account of the John Franklin Discovery Service Expedition, an ill-fated Arctic expedition launched from England in 1845 with the intention of mapping the Northwest Passage. It consisted of two ships, the HMS Erebus under the command of Sir John Franklin and the HMS Terror captained by Francis Crozier, each boasting heavily reinforced hulls and specially equipped steam engines to help force their way through icy seas. Despite these technological advantages, the ships proved no match for the Arctic ice and became hopelessly trapped in September 1846 somewhere around King William’s Island. In this tale, however, the doomed crews of the Terror and Erebus have more than just the harsh elements and starvation to worry about. Lurking out in the icy wasteland is monstrous creature stalking and attacking the men with ease. While the crews debate whether it is simply a particularly massive and cunning polar bear or the Devil itself, one thing is indisputably clear – if the elements don’t kill them the creature most certainly will. I enjoyed this book a lot and found myself getting caught up in the story and lives of the crew members. Simmons did an excellent job immersing the reader into this world through vivid descriptions and a healthy dose of sailor talk. It was a bit daunting at first, but I got used to it rather quickly and it didn’t take long for it to sound natural. The cast of characters was equally well-written and really brought the story to life. Even knowing their fates, I was on the edge of my seat as the crews of the two crippled ships struggled against all odds to survive the seemingly endless winter. The two individuals given the most page time, Captain Francis Crozier of the Terror and Erebus surgeon Harry Goodsir, were both really interesting and had very engaging stories in their own rights. Crozier in particular was a fascinating character to follow and we spend a lot of time in his head contemplating issues like depression, alcoholism, and how his Irish heritage often made him an outsider in the Navy despite his elevated rank. In light of this, the horror elements, while a good source of additional suspense, ultimately weren’t really needed. While I thought they offered a nice twist, I was always far more interested in the more worldly struggles of the crew than what was going on with the creature. Cut out the monster and the related supernatural elements and this would still be a gripping, harrowing story. Indeed, that seems almost possible since it often felt these scenes were inserted into the historical fiction at a later time. Besides, there was already plenty of blood and gore to be had in the normal course of ship’s duties, and that’s before the graphic accounts of scurvy recorded by Goodsir and the need for, um, “alternative” food sources comes into play. One thing this story did inspire me to do is read up more on this topic and that era of exploration in general. I’m not sure it’s something I’ll want to do during what’s supposed to be a rough winter in these parts, but I am updating my reading wish list accordingly. Great book that I’m really happy I finally got around to reading. I first read Dan Simmons earlier this year when I picked up Hyperion. I enjoyed the author’s writing style as he mixed a lot of different genres into the same “medium” Sci Fi narrative while heavily referencing other literary works (most notably the poetry of John Keats and the Canterbury Tales) to shape his story. I knew I wanted to read more of him and the Ilium/Olympos duology seemed like the most interesting next step for me. Plot Summary: The action in this story takes place a few thousand years in the future and is split across three separate groups. These groups cover a lot of ground in both time and space but converge towards the end. First we are introduced to a late 20th/early 21st century classics professor named Thomas Hockenberry. Much to his confusion and frustration, he has been reanimated from his DNA in an indeterminate time by beings that appear to be the gods of classical Greece. Their purpose in bringing him back is so he can observe Greek armies laying siege to Troy in a manner seemingly lifted from the pages of Homer’s Iliad. Using advanced technology provided by these gods, Hockenberry, along with a few others, is ordered to hide amongst the warring soldiers and report to a vengeful Muse how the action he observes matches the story he knew in his previous life. As the books opens, Hockenberry is in his ninth year of service and has been summoned to Mount Olympos where he is recruited for a special mission. This assignment, however, quickly leads to many unexpected events that could potentially change the course of the battle and threaten the fates of many Greek and Trojan heroes. We are then taken to a large social gathering on Earth and through some of the attendees introduced to a planet that has undergone many changes. Most of the population has either been wiped out in a plague many years earlier or evolved into beings called “post-humans” that have left the surface of the planet behind and transferred their consciousness and biological data into structures located within a system of polar and equatorial rings built in Earth’s orbit. Left behind is a small population of “old-style humans” who live in a stagnant society. While they are able to make use of some of the technological advancements made by previous generations, these old-style humans have little desire to further their own advancement or even question their surroundings enough to travel beyond a few hundred fixed stations offering instantaneous transport. Most of the needs of daily life like cooking and cleaning are done by automated service robots leftover from previous ages and taken for granted by the largely complacent population. Also watching over these humans are strange creatures called voynix that appeared sometime in the past from unknown origins and have come to life to protect humans from the dangers of an increasingly untamed planet. The action here follows a small group of friends drawn together by a man named Harman whose radical ideas and knowledge of forgotten arts inspire them to seek answers to some of the mysteries of their world. This journey soon takes them outside the sheltered confines they had known as certain discoveries shake the foundations their existence has been built upon. The final perspective offered in this story comes from two sentient biomechanical entities named Mahnmut and Orphu. These beings are collectively referred to as Moravecs and are descended from units long ago dispatched from Earth to explore the solar system. Mahnmut and Orphu are stationed on the moons of Jupiter and are part of a large consortium of similar entities scattered across the outer planets. As the story opens they find themselves assigned to a team dispatched to Mars to investigate inexplicable quantum disruptions and signs of a massive and rapid terraforming project. When the mission suffers a major setback they find themselves struggling for survival amongst strange little green men and powerful hostile beings, to say nothing of the war zone they encounter.